Fans of Libba Bray’s The Diviners will love the blend of fantasy and twentieth-century history in this stylish series. After rescuing her parents from the Seelie king at Hearst Castle, Callie is caught up in the war between the fairies of the Midnight Throne and the Sunlit Kingdoms. By accident, she discovers that fairies aren’t the only magical creatures in the world. There’s also Halfers, misfits that are half fairy and half . . . other—half paper, half steel girder, half electric spark. As the war heats up, Callie’s world falls apart. And even though she’s the child of prophecy, she doubts she can save the Halfers, her people, her family, and Jack, let alone herself. Bad Luck Girl, they call Callie, and she’s starting to believe them. Why did I read this book: I’ve recently discovered the work of prolific science fiction author Sarah Zettel and was delighted to learn of her new YA fantasy trilogy. Having read and thoroughly enjoyed Dust Girl and Golden Girl, I was eager to finish Callie’s story in Bad Luck Girl. Callie LeRoux has done the impossible. She has saved her mother and father from the clutches of the shining ones, but at great cost. Her actions to free her family have officially started a war between the Seelie and Unseelie courts – a war that had been a long time coming, but devastating nonetheless. Now, Callie, her family, and her best friend Jack are on the run, fleeing Los Angeles in search of some safe haven where they can regroup, rest, and figure out what to do next in order to survive. With angry fairies from all sides eager to get their hands on Callie, the girl of the prophecy whose unique power means she can walk between worlds at will, safety is hard to find. Worse, when Callie and her family take solace at Jack’s old family home in Chicago, Callie realizes that her father – the powerful Unseelie Prince whom she’s only just met and desperately wants to love – may not have all the answers. Callie must rely on her heart and her conscience in order to prevail – even if that means going against the wishes of the family she’s fought so hard to save and reunite. The third (and perhaps final) book in the American Fairy Trilogy, Bad Luck Girl is the dramatic, culminating reckoning of Callie’s hero’s journey. In Dust Girl, she discovers her heritage as the half-daughter of a prince of the Unseelie Court and sets out to find and save her human mother; in Golden Girl, Callie begins to understand the prophecy and the extent of her magic as she’s able to save her mother and father from the cruel Seelie Court. And here, in Bad Luck Girl, Callie grows up. Related to that arc of personal growth, another thing Zettel does so beautifully in Bad Luck Girl is examine interpersonal relationships, between Callie and her parents, and between Callie and Jack in particular. The fraught relationship between Callie and her father I’ve touched on already (and is done beautifully in its measures of mistrust and love), but really the interesting re-connection here is between Callie and her mother. For the majority of this series, Callie has spent her days desperate to find and bring her mother back, and now when she finally has done that, everything is different. There’s the pain and frustration Callie feels for having been lied to by her mother for so many years, never knowing about her true heritage and her own father; more than that, there’s this underlying tension because now that Callie’s father is back and he and her mother are closer than ever, where does Callie fit into the picture? And then, of course, there’s Jack. The only constant in her life since her magic was unleashed in River Run, Jack has become something very special to Callie, and vice versa. Their relationship, rooted in friendship but becoming something more, is a wondrous slow burn of a romance, finally culminating here in this third book. All I can say is: it’s about time. Finally and most importantly on a thematic scope, I love the way Bad Luck Girl deals with the question of identity and prejudice. This series overall has dealt with racism and prejudice in a very tactile and overt way – not only is Callie a daughter of fairy and humanity, but she’s also half-black and half-white. For most of her young life, she’s listened to her mama’s rules and has been careful to stay out of the sun, to keep her coarse hair pulled back, to attempt to pass for white in a time when being black (or worse, being mixed race) is so harshly, even violently censured. 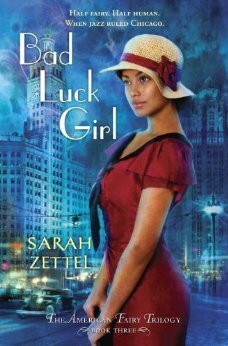 In Bad Luck Girl, the prejudice Callie faces is two-fold as she learns that beyond the Seelie and Unseelie courts, there are the mixed race half-humans like herself, who are universally reviled by fairykind. When Callie witnesses this prejudice in her own family, she’s determined to fight against it because she knows firsthand how deeply wrong this kind of oppression and bigotry is. While Bad Luck Girl hits so many sweet notes with its thematic and character heft, the only downsides to this book were in the plotting and setting department. In terms of writing, the story is resolved nicely, although there seemed to be an awful lot of Callie walking away angrily from her family and everyone else over and over again, followed by a supremely rushed ending. Similarly, I was hoping that this third novel would have the same kind of historical detail poured into the new setting of Chicago as there was in Golden Girl‘s Los Angeles or Dust Girl‘s River Run. I wanted to see more of the jazz, more of the vibrant culture that shaped the Depression Era city – and while the setting still feels genuine (and there’s some great scene setting for Chicago’s Hoovervilles), there’s a lack of the same kind of meticulous detail that has become a hallmark of this series. The only other major issue I had with this book is the novel’s epilogue, which reads to me as a tacked-on, overly sentimental, gruesomely gratuitous Happily Ever After (which also randomly alludes to future adventures with Callie, Jack, and her family). This might be a matter of purely personal opinion, but the Epilogue to me felt entirely unnecessary and the story would have been better had it simply ended with the final chapter’s hopeful, poignant closing lines. Still, these criticisms said, Bad Luck Girl is a triumphant finale to a vibrant historical fantasy series. I will miss Callie and Jack, and the Seelie, Unseelie and Halfer fairies in all their glory – but I sure have enjoyed the ride. If you haven’t read the American Fairy trilogy yet, what are you waiting for? I highly recommend you get started. Now. He didn’t say anything after that. His shining eyes drifted shut. I sat there a long time, staring at him. Papa coughed and twisted like he was trying to turn over but couldn’t quite. My stomach knotted up. I didn’t know what to feel. I wanted to love my father. I wanted it so bad it was like a hunger inside me. But I couldn’t tell if I really did love him, or if he was worth loving. He said he wanted to be a good father, and I believed that. But at the same time, he’d been ready to leave people to die back under the prison tree, and he had Mama so snarled up, she’d been ready to smack me because I wouldn’t do what he said. He’d gotten us into trouble, but he’d gotten us out too. His courage in riding the train was genuine, because this trip was just plain killing him. It wasn’t being slow about its work either. If Papa was this sick already, how was he going to last all the way to New York City?